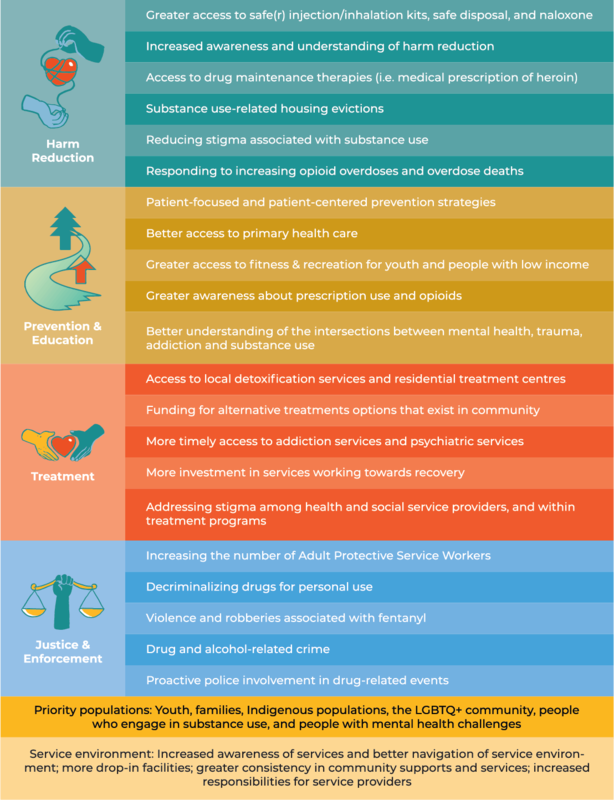 Substance use trends are evolving constantly and communities need to continuously adapt and respond to concerns and harms associated with substance use. That being said, it is important to have a snapshot of the substance use trends for alcohol and other drugs to provide context for action. In 2016-2017, the HKLN Drug Strategy engaged service providers and community members in a consultation process in each of the three counties to better understand their concerns and priorities for matters related to the harms associated with substance use. To our knowledge, this is the first time a broad survey has been completed in regard to people’s attitudes and perceptions of substance use in the HKLN region. The key concerns and priorities that resulted from these surveys have been collected and analyzed to inform future program plans aimed at reducing the harms associated with substance use. As a result of the community consultation process, there were 548 surveys completed, either online or with a paper copy. Special efforts were made to get input from significant populations, including visits to three methadone clinics – one in each of the three counties. The number of survey respondents was largely driven by service providers and organizations in the three counties that offered paper copies of the survey to clients (who might otherwise not have completed it online). In addition to the community surveys, informal, open-ended interviews were held with 79 service providers from 55 organizations and/or departments. In a second survey that was conducted between July and August 2018, service providers across the three counties were asked whether the priorities they initially identified were still important and aligned with their work. The survey had 62 respondents, and the survey data were collected and summarized to substantiate the priorities identified during the first consultation process with service providers and community members. A summary of the identified community priorities will follow. Shared ownership of identified priorities or priority areas provide opportunities for leaders to emerge, partnerships to develop, and collective action to take place. The priorities identified to date are grouped together by the four pillars of the Drug Strategy and are outlined below. There are also a number of key items, such as priority populations and factors within the service environment, which transcend many of the priorities and guide the manner in which each priority could be addressed. Actions taken to address these priorities will facilitate a coordinated response in the three counties. With the priorities identified regionally or locally, members of the Drug Strategy can promote collaborative action on the priority areas by leveraging their experiences and resources, allowing for a number of positive outcomes. Within each key priority area are other sub-priorities that fall within one of the four pillars. These are shown in the table below. To view the full Community Priorities 2018 Report and summary infographic, click here.